Black Garlic's rise to culinary fame was rather short lived. Heads of garlic slowly heated at high temperatures until they caramelize, turn black, taste sweet, and lose their sharp bite? It sounds wild, but didn't really stick around. Sure, it could always come back, but I get the feeling the moment and novelty may have passed for this unique food. It never became the workhorse stable, like quinoa or chipotles, or the star ingredient-of-the-moment, like chocolate bacon, za'atar, or truffle oil on anything. I played around with black garlic myself and while I loved the unique, sweet flavor of the black bulbs, I never really hit my stride with it. But maybe I was using it all wrong. Despite being an Asian ingredient, I've found cheese has a wonderful affinity for black garlic. Well, I didn't find it out, I bough a wedge of Black Gold, a raw milk, gouda-style cheese made locally by God's Country Creamery. I thought it said "Black and Gold," and wanted to get it for my wife and her Pittsburgh Steelers friends. But tasting this cheese, it has a wonderful flavor of sweet, earthy garlic and a long, savory umami finish. Describing the flavor profile, it reminds me a lot of words used to describe black truffles: earthy, savory, umami, garlic without the bite. And truffles love fat and cream and butter. I think part of it is that the fat helps to capture the flavor and give it a lasting presence on the palate. 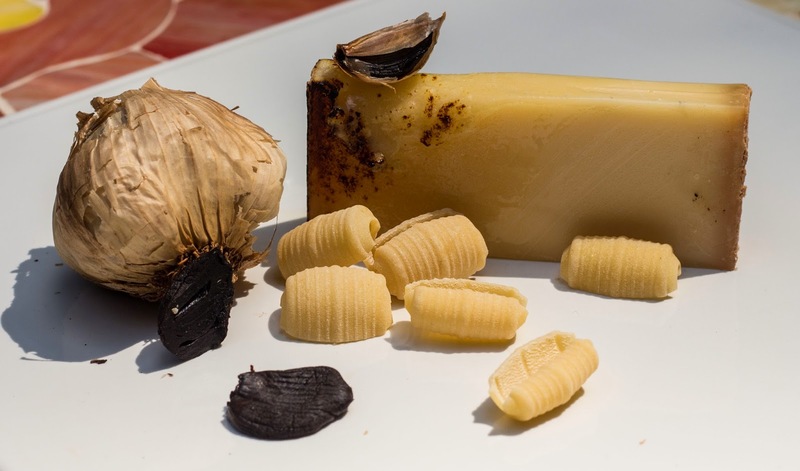 Tasting the black garlic cheese, I really felt like the flavor and intensity of the ingredient became the highlight. While I enjoyed black garlic before, this cheese pairing was greater than the sum of its parts. I ordered a few heads online and plotted. Now it was time to try this on my own. Black garlic is sticky and gummy, and I didn't relish chopping it up. So I peeled two heads and pureed them in a blender with whole milk. I used this as the base for my Gruyere and cheddar black garlic mac and cheese. I didn't go far off the path of a basic mac and cheese recipe, as I really wanted to see if I could capture the black garlic flavor like God's Country Creamery. 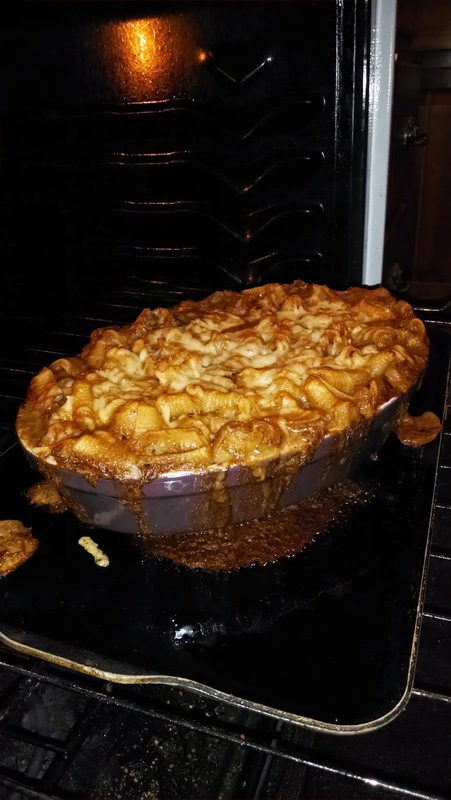 Hot and bubbling out of the oven, I snuck a crispy bit of the crust and felt success. Savory, sweet, with the unique flavor of the black garlic. It's funny to say this, but I feel energized after finding success with this recipe. Now I'm curious to take black garlic back to Asian recipes and try it with the Asian equivalent of cheese making: tofu. Thanks for your insights and great recipe using Black gold, our invention and collaboration with God's CC. I invite you to check out our site, www.ObisOne.com, to see other products you might enjoy. You'll find our organic black garlic bulbs have more texture and structure than those found elsewhere. Our "Black Crack" has also been a big hit. Thanks so much! This was a lot of fun for me to rediscover black garlic. I had no idea you had worked directly with God's CC, you really hit a home run with that pairing! I'll definitely check out the black crack as well - I didn't think it would work in a pepper grinder, but that looks really cool for adding a finishing touch. 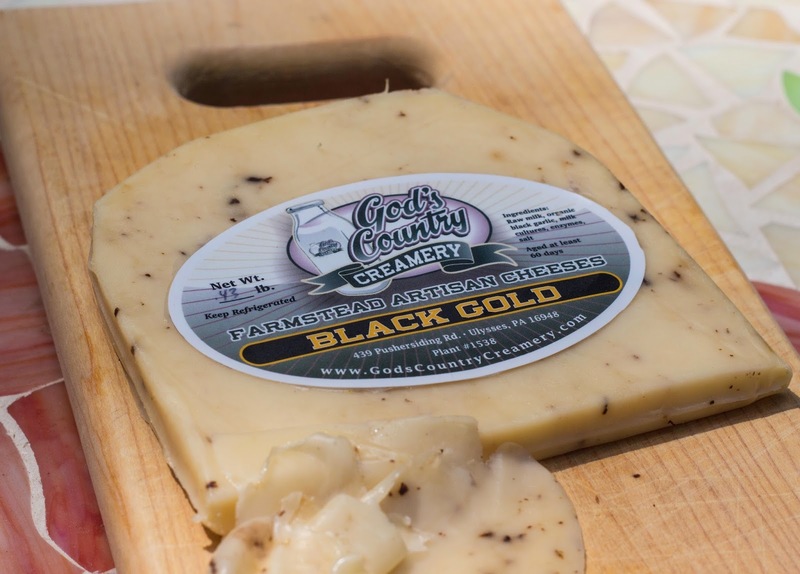 Thanks so much for your kind remarks regarding our Black Gold cheese!